How does a single cell develop into myriad different specialized cell types, control the organization of these different cells into tissues and organs, and ultimately form an unimaginably complex living organism like a human being? How is it possible for some adult animals, but not others, to regenerate fully functioning limbs? 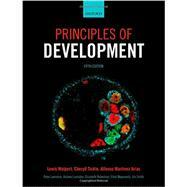 Answering these questions and many more in captivating detail, Principles of Development, Fifth Edition, introduces students to the fascinating field of developmental biology. It clearly and succinctly explains cutting-edge science and illustrates principles with a variety of custom-drawn figures, animations, and links to online movies that show development happening in real time. The authors consistently focus on the key principles of development--the underlying processes shared by diverse groups of organisms. This emphasis on principles provides a framework on which students can build a rich understanding of specific topics. Extensive pedagogical support materials, both in the book and online, make this text the complete package for students of developmental biology. Lewis Wolpert is Emeritus Professor of Biology at University College London. Cheryll Tickle is Professor Emeritus at the University of Bath. Alfonso Martinez Arias is Professor of Developmental Mechanics at the University of Cambridge.